Stay in touch with what's going on! We will be using the CHARMS system as our main link between parents and the Etiwanda High School music and guard programs. For your student to get the most out of this program it is vital that you keep in the loop. By completing the below registration process it will be much easier for you to keep in the know. Please help us maintain our records. Make sure we have contact information for at least 1 adult connected to your student. You can do this by clicking the "Add Adult" tab under your student's information section. If you or your student's information changes at any time please remember to update this section. 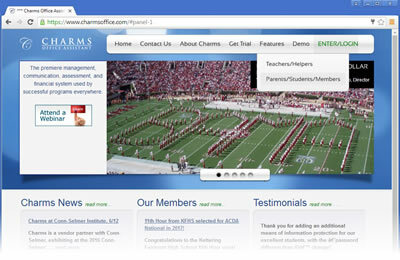 Log onto www.charmsoffice.com and click the "ENTER/LOG IN" tab in the top, right-hand side of the screen. Log in as a "PARENT/STUDENT/MEMBERS LOGIN". Your student should have received instructions along with his/her password. If you have problems logging in or you don't have the password/the password is not working, contact Leilani Swann at EHSBCG.secretary@gmail.com or Sandy Kamiyama at EHSBCG.communication@gmail.com. If logging in for the first time you will be required to set your permanent password. Note: Parents and their student will share the same account and password. Use the menu buttons to update student information, provide parent contact information, place your order for student clothing, link sibling accounts. If you need assistance please feel free to contact Leilani Swann at EHSBCG.secretary@gmail.com or Sandy Calonge at EHSBCG.communication@gmail.com. If you should need to reset your account/password they will be able to help. We are hoping to be 100% online this year and your information into CHARMS will make that happen! !